Took me awhile to finish this one. Balancing appointments, family and watching my new baby. The struggle is real to do personal art and juggle family life and work. Grateful to sneak in a few hours here and there in between jobs to paint. While working on this mural my wife was ready to give birth at any moment. I would drive from Waimea to Kainaliu. The drive is about an hour and a half. At any moment painting this mural I can get a call from my wife and I would have to stop the project and head out. This was one of the most stressful murals I had an opportunity to participate in. Long story short I helped with the students and finished the project with them within 3 days. 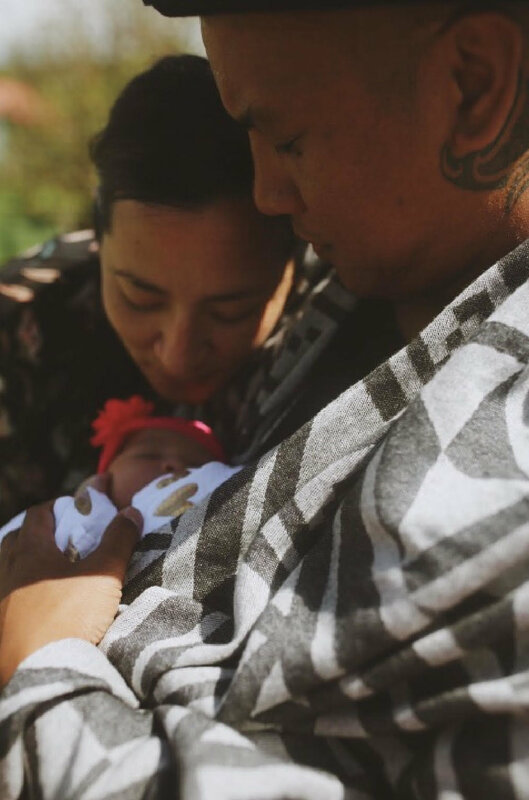 The last day I stayed home and my wife gave birth to our beautiful daughter Eyris Laniakea. In celebration of Ka Papahana Kaiapuni’s 30th anniversary, The Living Legacy Series has announced the launch of Ke Kanakolu, a project that uses art as a medium to invigorate Native Hawaiian identity while perpetuating Hawaiian values, language and culture. 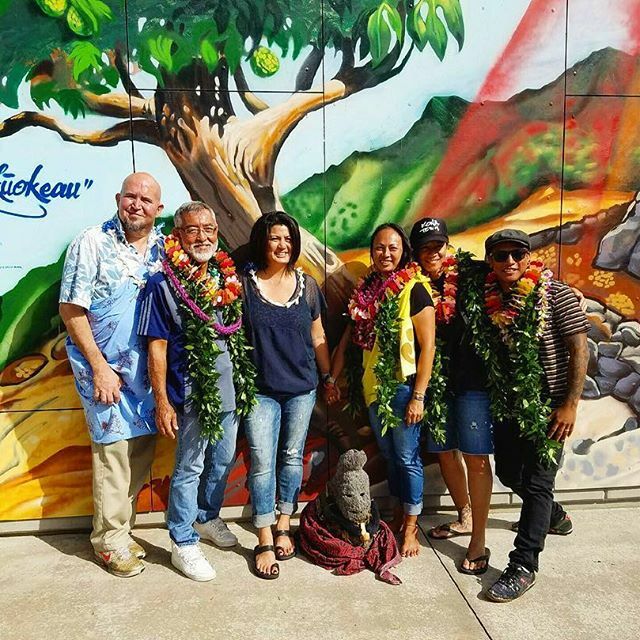 Since August 2017 through May 2018, ʻĀuna Pāheona, a collective of art-centric individuals, will travel to five islands to engage local artists and Hawaiian immersion schools to design and create 10 murals inspired by the mo‘olelo of Kalapana on Hawai‘i Island. 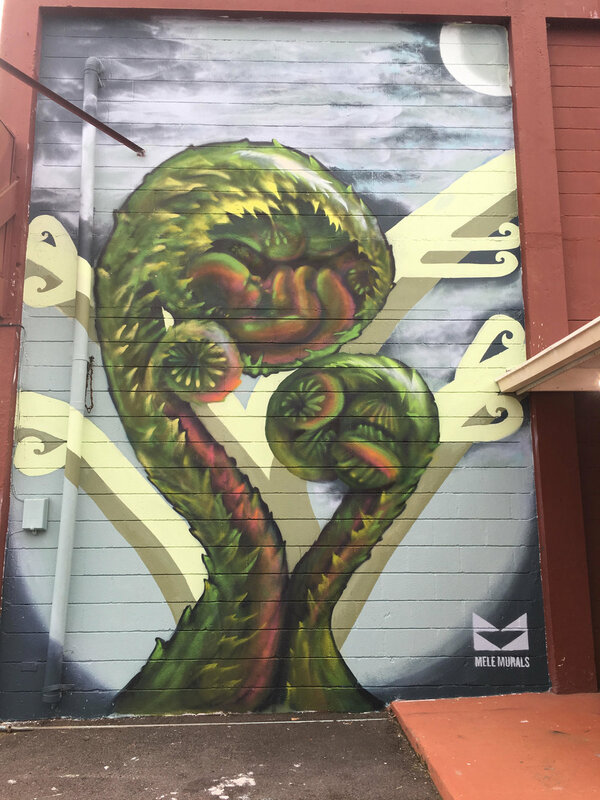 schools that form Ka Papahana Kaiapuni, as well as the importance of perpetuating Hawaiian language, deepening connection to the ‘āina and fostering the responsibility of honoring ‘ike kupuna,” said Ke Kanakolu Project Manager Mahea Akau. The story of Kalapana includes his father, Kānepōiki from Kona, Hawaiʻi, and his mother, Halepākī from Kauaʻi, who has the welo ʻohana of hoʻopāpā (a wordplay or battle of wits art form). 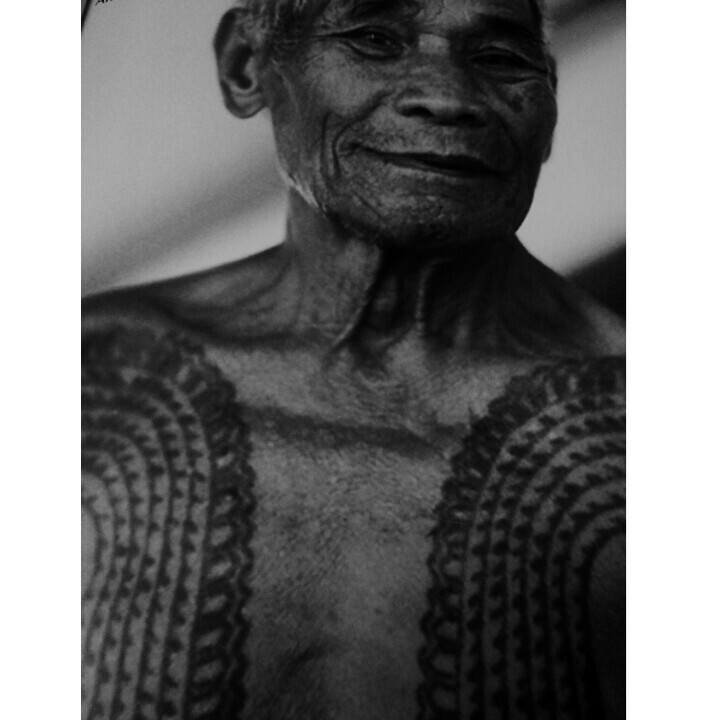 Kaua‘i chief Kalanialiʻiloa hears of this hoʻopāpā art form and becomes obsessed with mastering it. In no time at all, he masters hoʻopāpā via Halepāiwi and Halepāniho, Halepākīʻs older brothers, and desires to construct a pā niho (tooth enclosure) and pā iwi (bone enclosure) for his chiefly residence of Kauaʻi. Eventually, he starts challenging other hoʻopāpā practitioners, including Kānepōiki. While on Kauaʻi, Kānepōiki loses the battle, and his teeth and bones are used in Kalanialiʻiloaʻs chiefly residence. When Halepākī heard of Kānepōikiʻs death, Kalapana was left fatherless at a very young age. When Kalapana matured, he desired to avenge his fatherʻs death and travel to Kona to learn hoʻopāpā from Kalaoa. When Kalapana reaches Kauaʻi, Kalanialiʻiloa’s men attempt to fool and trick Kalapana into a death sentence. However, Kalapana’s wit, tenacity, and love for his land and family prevail; he knows all the winds, rains, plants, songs and ʻai that was unknown to Kalanialiʻiloa.